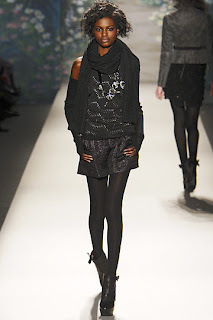 There wasn't one running theme for Tracy Reese Fall 2010, but rather a mixture of prints and details that would interest one person or another. 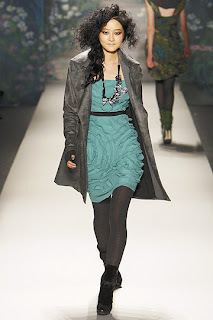 Tracy Reese is a favorite of mine when it comes to fun, flirty frocks. 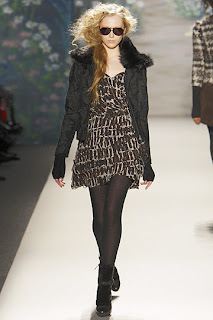 The fall season brings lace and embroidery, lacquered jacquard, ruching and jackets with fur trim. 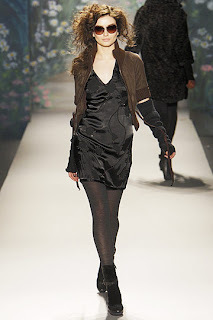 Accessories include arm warmers and feminine scarves. Turquoise, blue, brown, grey and black are my favorites of the palette. 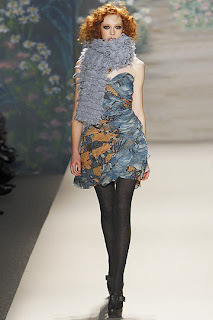 Adding to the mix are smoky florals and leopard and houndstooth prints.